This past April, ice cream lovers visiting the Plaza Mayor were given reason to celebrate. At Calle Ciudad Rodrigo 6, linking the Plaza Mayor to the Mercado San Miguel, Mistura opened their 2nd ice cream shop, serving what is possibly Madrid’s best homemade ice cream. Mistura’s opening coincides with the equally encouraging and long-overdue refurbishment of the Plaza Mayor, returning Madrid’s main square to her deserved glory in time for the 400th anniversary in 2017. This refurbishment is matched by an impressive cultural initiative launched by city hall to bring more locals back to the Plaza Mayor in mass, from which wonderful local businesses like Mistura will benefit greatly. 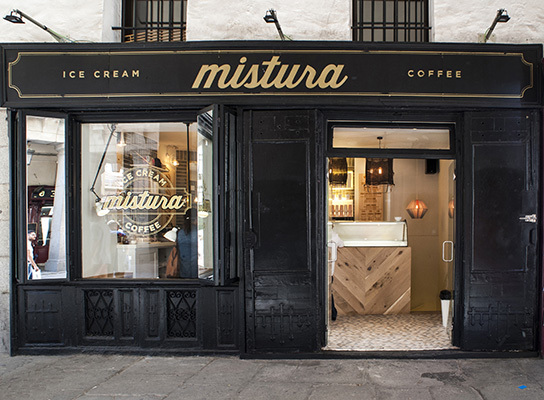 During a trip together through India, Mistura founders Carlos Sotomayor and Carmelo Rodríguez came across a unique ice cream shop whose technique would spark the idea for Mistura once back in Spain. The technique, familiar to Cold Stone Creamery customers, employs a frozen granite slab and a pair of metal spatulas, used in combination to fold your toppings into the ice cream once you’ve ordered. This massage technique not only develops the ice cream’s texture, but better incorporates the different ingredients as well. At the same time, the action contributes enough friction to bring the ice cream up to a richer, more mouth-pleasing temperature. The technique would be worthless of course without the finest raw material, a crucial aspect of Mistura’s ice creams and sorbets, the latter of which are made with over 60% fresh fruit. These raw materials are not only of extreme quality, but whenever possible, extremely local as well. Organic milk and eggs are purchased from a small farm just outside Madrid, while the majority of the fruit and vegetables used in their sorbets and juices are of Spanish origin. It is the milk however, ice cream’s key ingredient, where Mistura truly stands out. Traditionally, ice cream shops buy pasteurized milk and combine it with sugar and the chosen flavors (chocolate for example). Spain’s sanitation laws require that the final mixture is pasteurized again before being sold. However, a single pasteurization is enough to eliminate any possible pathogens in raw milk. Therefore, the resulting double pasteurization only reduces flavor and nutrients in the milk, something Mistura was determined to change. After receiving approval from the health authorities, Mistura now buys their organic milk unpasteurized, and then incorporates the sugar and the selected flavors. This final blend is then pasteurized just once, resulting in a far superior product. While the ice cream’s base ingredients are sourced locally, Mistura has sought out global examples for the best representation of each flavor: pistachios from Sicily, vanilla from Madagascar, dulce de leche from Argentina, coffee from Columbia, and mangos from Brazil, to name just a few. Also reassuring is that there’s just a handful of flavors, and the focus is on what works best: recognizable classics done incredibly well, rather than gimmicks like green asparagus, mushroom, or even ketchup ice cream (a certain Madrid ice cream shop shall go unnamed). While flavors and toppings can be combined any which way, Mistura also makes several classic suggestions, such as vanilla with cookies, dulce de leche with banana, or yogurt ice cream with fresh strawberries and raspberry jam. My personal favorite continues to be dulce de leche with brownie. In harmony with such quality, there is a total absence of industrial ingredients. Mistura’s ice creams and sorbets carry no preservatives, no taste boosters, no chemical thickening agents, and no artificial flavors. The environmentally-friendly side in all of us will also be happy to know that the majority of the Mistura’s supplies are either recyclable or made from recycled material, all served in a warm and cozy atmosphere courtesy of Madrid in Love, whose secret speakeasy-like basement is the ultimate chill-out lounge. Should you not be in the mood for ice cream or a milkshake (shocking as this may sound), Mistura offers a range of other foods and drinks. Fruit and vegetable juices made to order, iced tea, homemade cakes and crumbles, healthy breakfasts based on homemade yogurt, oats, quinoa or muesli, as well as their unbelievable waffles. This last item is a favorite of Carlos’s, and for good reason. The batter includes a mix of 25 different spices, on top of which melted chocolate and vanilla ice cream make for an fabulous and filling treat. Last but not least, Mistura also strives to make itself a destination for coffee lovers. They’ve put together a very personal blend based on top quality 100% arabica beans from countries such as Columbia, Brazil, Guatemala or Ethiopia. Their staff has also been trained to take full advantage of the super stylish Dalla Corte Evo 2, the latest model from the Milan-based company whose price tag tops out at $10,000. Looking for things to do in Madrid? Get to know the city more in depth with a Historic Madrid Walking Tour, Gastronomic Madrid Tapas Tour, Madrid Wine Tasting, or take a wine tour of the Ribera del Duero region. * All photos in this post were generously provided by Mistura Handcrafted Ice Cream. Good recommendation, Nygil!! Thank you. My pleasure Agus! Next time you’re in Madrid, we’ll have to pay a visit together! Based on your recommendation, we stopped in for coffee and enjoyed the Chill-Out lounge for a much needed break! Their coffee is excellent, and the barista’s knowledge showed in the milk prep for lattes — perfect temperature and foam (not easy to do) and a delicate pattern made to the rim completing the pour! Excellent! So glad to hear it! Every time I’m in the Sol/Plaza Mayor area, I stop by Mistura for a coffee. It’s such a treat to have that kind of quality available even in the more tourism-oriented parts of town. Getting to know a new city shouldn't be limited by your pocketbook or your guidebook. That's why here at Madrid Tours & Tastings, we've created a set of experiences that bring out the best of Madrid, sharing with you the cuisine, streets, monuments and history of Spain's exciting capital.